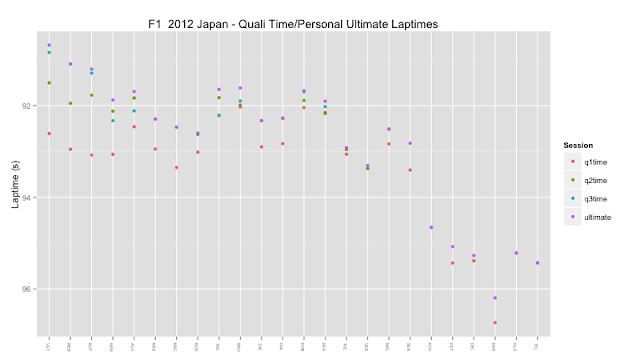 (Part of the rationale for these posts is to explore what we can learn about a race just from the published data. Many of the "anomalies"/deviations from expected behaviour or "odd things" in the charts may be easily explained by anyone who saw the session, but can we use the data to help us as questions about what happened to a particular driver for example (even if the answer turns out to be obvious, like a driver spinning off at the start of the session). 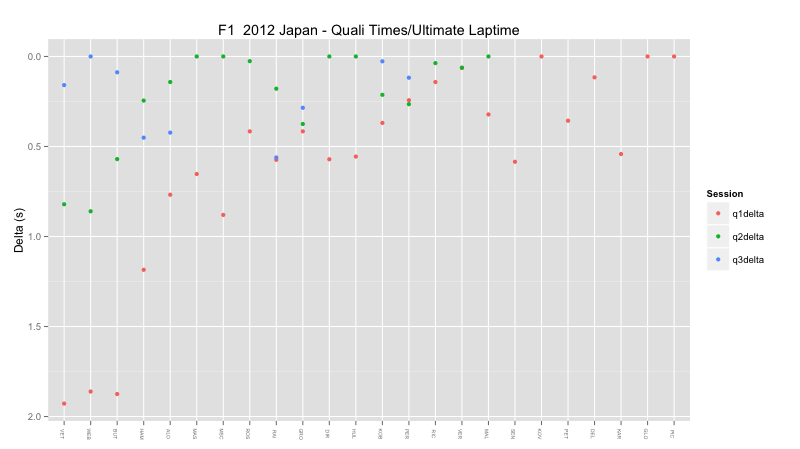 Another way of thinking about this might be to ask what additional data do we need to explain what happened in a session if all we have to go on to generate a race report is the published data? 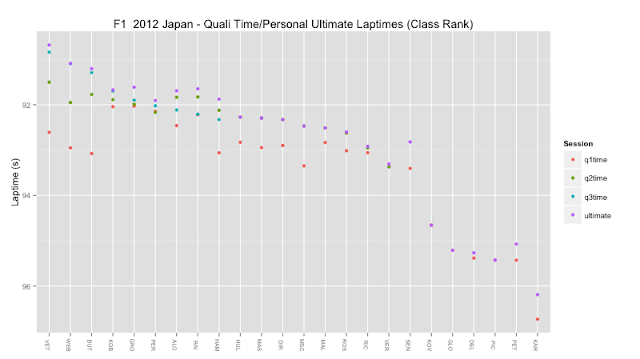 1) what sorts of things do each of these charts reveal about the session/what sorts of commentary/interpretation would you like to see/how might these charts help make sense of, reveal things that happened in, or hint at possible stories relating to the session? 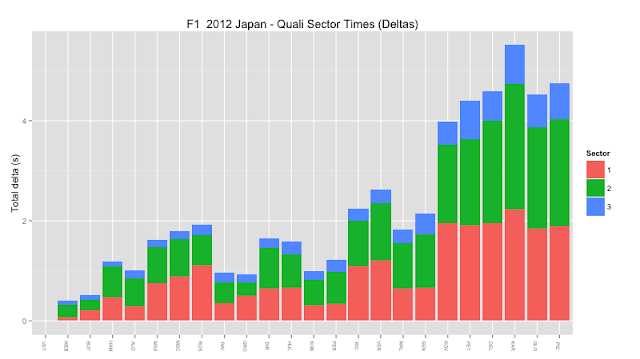 2) how could the charts be improved? 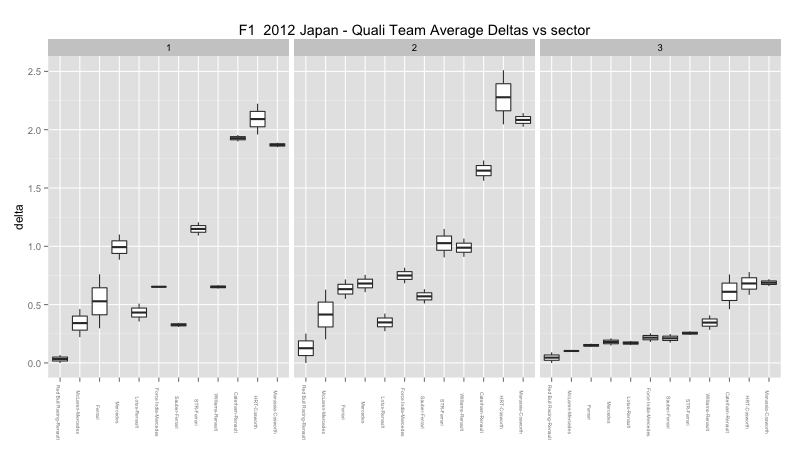 3) what other charts might be useful? How close to their ultimate laptimes did each driver get? SEN and KAR were way off, and VET didn't do so well either? 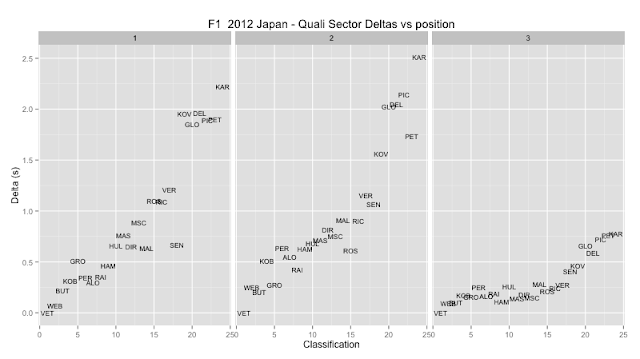 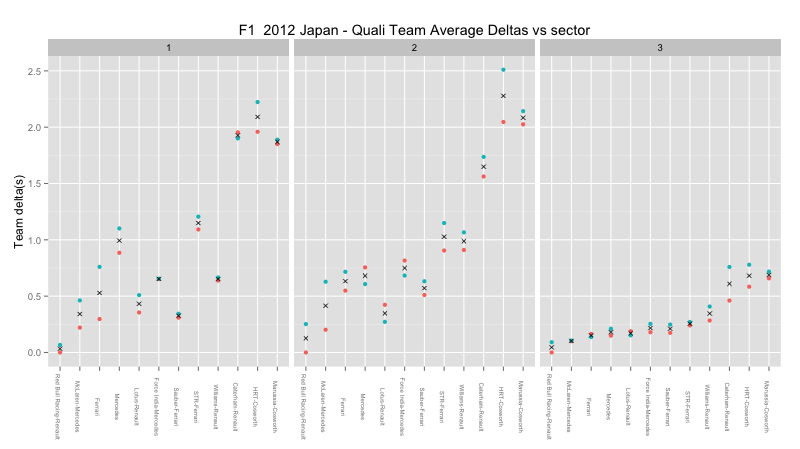 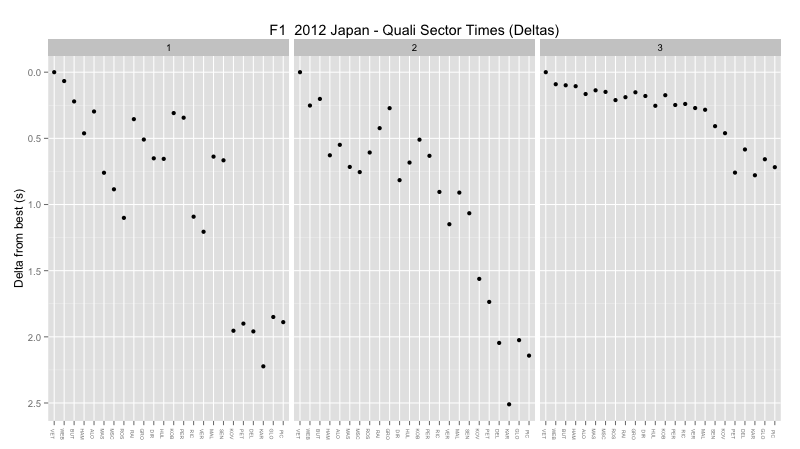 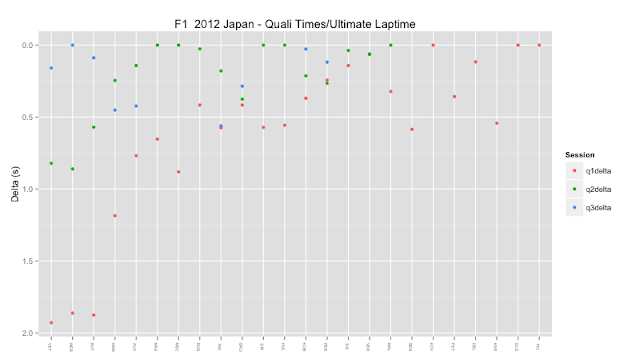 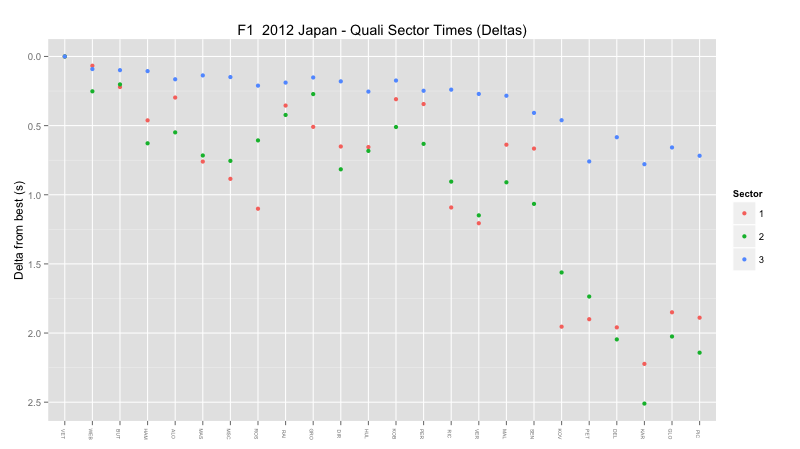 Sector comparison across qualifying - what are the deltas to the best overall sector times? If we order the drivers by car number, team performances are a little clearer to see? 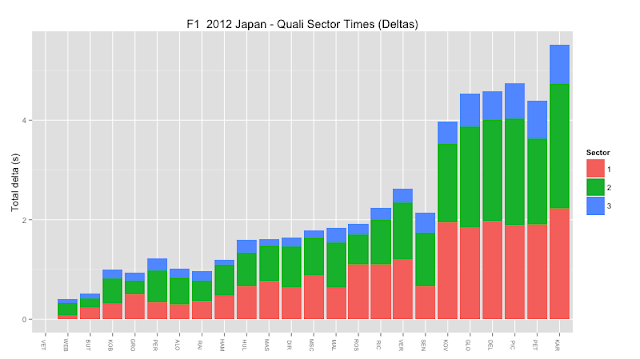 This chart suggests to me that sector 1 is where most time is being lost in the first sector, but I'm not convinced about those colours (does a block of the pinkly colour feel bigger than a similarly sized stacked block of the green colour?) Looking at the range of the y-axis in the chart below, which shows the deltas to the best sector time, we do see that for cars 6-8, they are losing more time in sector 1 than sector 2. So for example, here the order is by overal qualifying classification - of a driver looks to be high in a column, for example, PER in sector 2 and 3, they're losing time there... 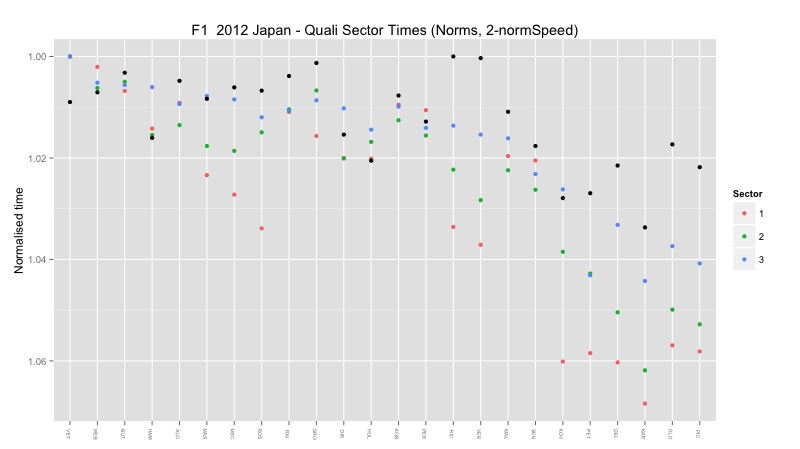 If they appear to be low in a column, for example SEN in sector 1 or ROS in sector2, they're making up time. So for example, ROS did better in sector 2 than his overall classification suggests, and whilst MSC messed up/was below the line in sector 1, he did well (above the line) in sector 3... 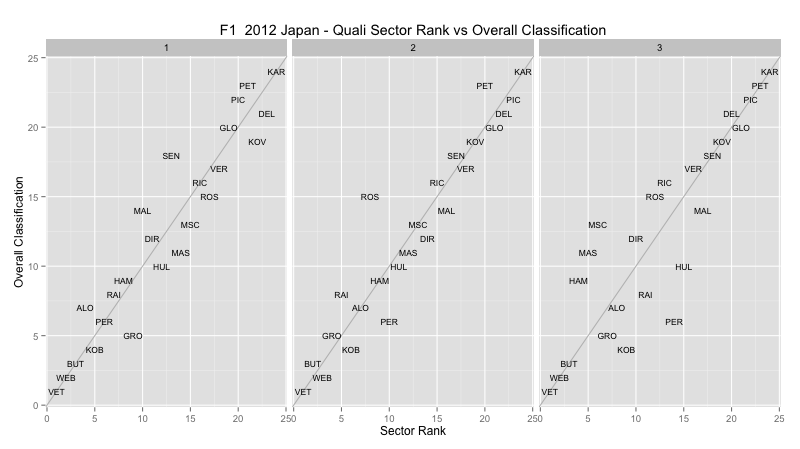 BUT also appears to have the better of WEB in sector 2? 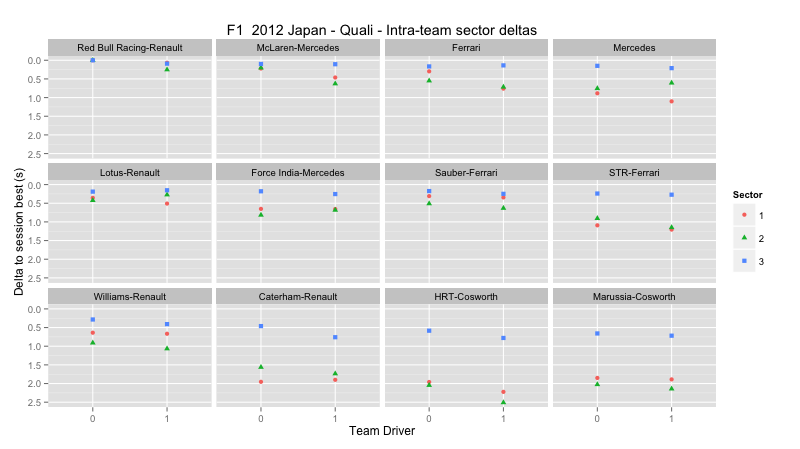 PER is underperforming in sector 2 and 3, as was also suggested in the previous chart. 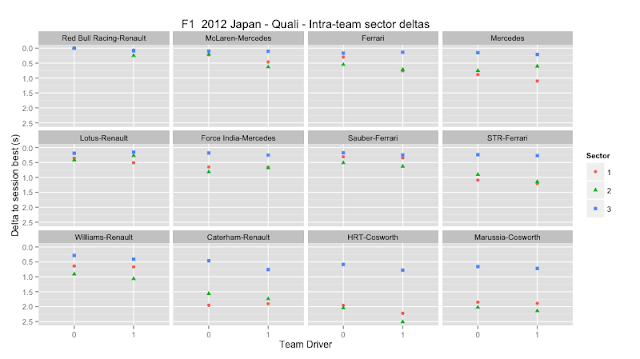 How are the teams losing time by sector? 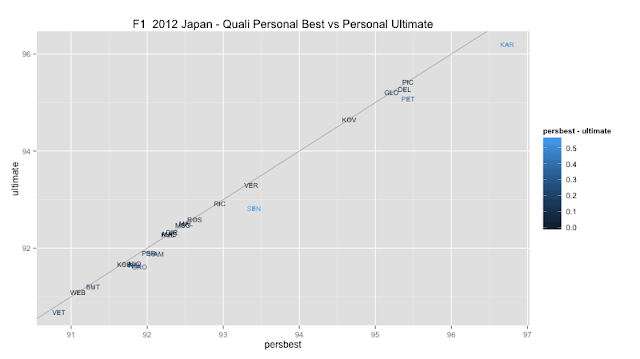 Does this chart help? 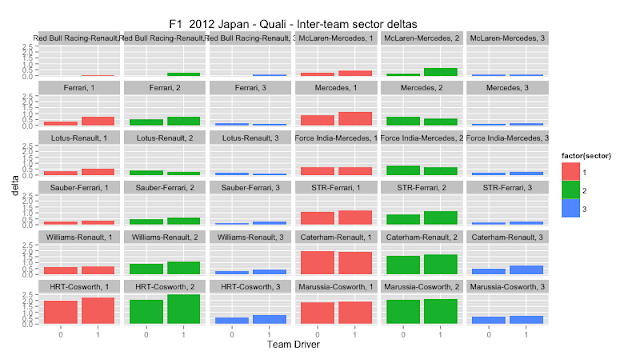 Mercedes and Toro Rosso seem to be losing out in sector 1? 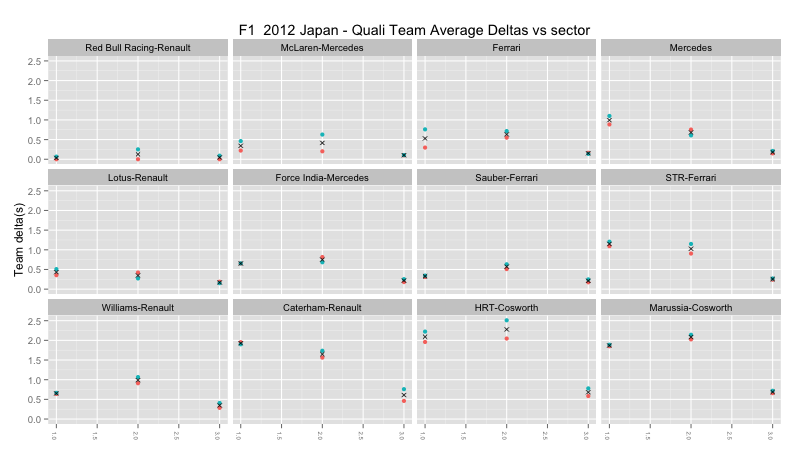 Maybe ranking teams by their average sector times would be useful? 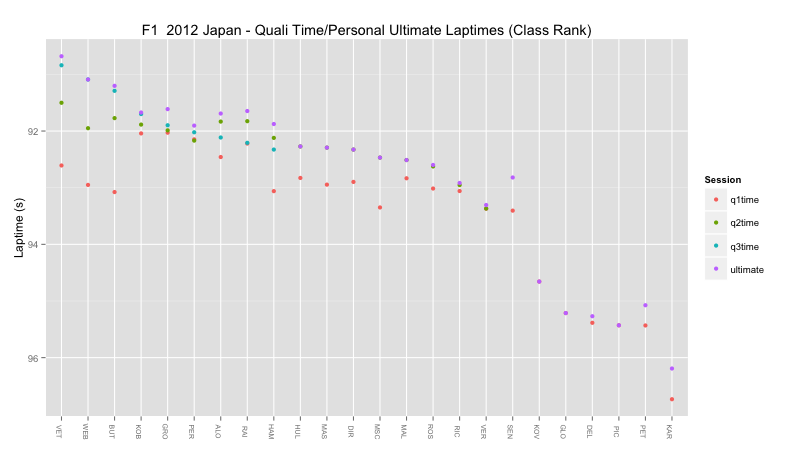 Something like this maybe? Or maybe presented by team?